Today at the Tokyo Game Show 2013, I got some hands-on time with Lightning Returns: Final Fantasy XIII. As this is the first time the game has been playable in Japan, I was excited to see what all the hype was about. And simply put, I had a lot of fun just playing it. Here are five reasons why. As this was my first time playing Lightning Returns, I kept with the default job setup—Equilibrium (her default knight-like costume), L'Ange Noir (a mage class), and Dragonslayer (the typical Dragoon class). As I went through several battles, I was impressed at how different each job played—even when they shared attacks. For example, when Equilibrium Lightning cast the thunder spell it did almost no damage compared to when L'Ange Noir Lightning cast the same spell. Defense was handled similarly—while all three classes could block, the two melee classes took far less damage than the mage class. 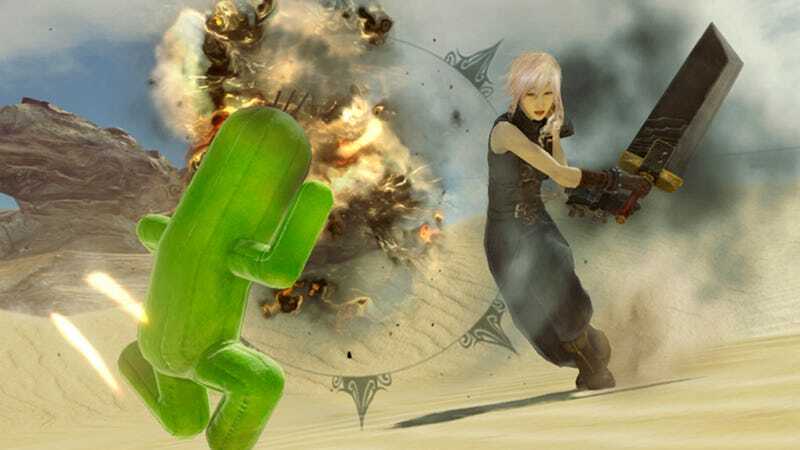 Moreover, switching jobs in Lightning Returns is as simple as hitting L1 or R1—and the change is nearly that quick. This allows you to watch for the enemies attacks and switch to a class with a high defense to block the hit—if you are fast enough, anyway. I also liked that the game forced me to change jobs constantly—as using one job replenishes the other two. This kept everything exciting and forced me to adopt a constantly changing strategy. While I left the demo set to its defaults when I was playing, I stuck around to watch other people not only try out many of the other jobs, but also customize the jobs with a variety of different attacks and spells. From what I saw, there is an amazing amount of customization possible that will allow you to play the game in any number of different ways. While I only saw a small part of it, the map I was in was huge. Far from the city I have seen in trailers and gameplay footage, this demo was set in the rural countryside—in a village and the rolling hills around it. The open world left me with a myriad of possibilities. Should I talk to the people in the town and do their quests? Should I explore the countryside instead? Or should I just press on with the main story to see if I could find a missing chocobo? As the camera was moving around quite a bit in battle (following my current target), it was common for several of the enemies to be out of my field of view at any given time—not that that stopped them from attacking. Luckily, even though I couldn't see them, the sound cues were so distinct, I had no trouble blocking spells cast off-screen. I imagine that paying attention to sound cues will make all the difference in a game as chaotic and flashy as Lightning Returns. Lightning Returns: Final Fantasy XIII will be released for the PlayStation 3 and Xbox 360 on November 21, 2013 in Japan and February 14, 2014 in the United States.